ver 3.0 supported ! 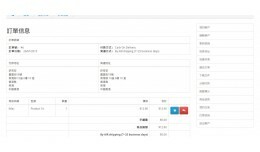 .... 香港全方位中文語言包 齊齊來感受一下 Opencart 3.0 香港繁體語言包 多謝各位支持，今年為大家帶來更多文字及元素，由中文包加了『中文繁體語言包以外的翻譯』 �..
HK Traditional Chinese language pack OC v2.2 - v.. 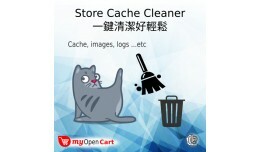 This is for Opencart version 3.0 and auto-refresh after click restore button added. Don't worry, you can RESTORE it right now with this fabulous extension called Restore Trash It can restore deleted items from trash in your OpenCart admin Fea..
Opencart Trash: Slasoft OC Ver3.0 Restore your .. This extension help you to send the sticky notes to other users in OC admin. There are different color notes you can select [OC v2.3.0.2 樣版店Sample Site] https://demo.myopencart.hk/admin user: demo password: demo ---------------------..
Boring to work with hundreds of products updates, and need to scroll up and down with many layers of menu to dig them out?! 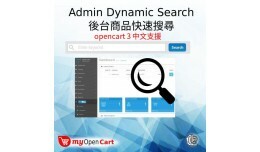 Demo Admin: https://v3.myopencart.hk/admin User: demo Password: demo Here is the solution: Admin Dynamic Search .. The best and most flexible design for your SEO url editing and modification for OC ver3.2 真正多語言支援，中文與英文可分開輸入。 樣本： https://v3.myopencart.hk/卓上電腦/Mac-機/iMac 電腦 https://v3.myopencart.hk/..
Slasoft Global Admin Language Switch for OC ver.3.0 It is a very powerful and useful extension if you have 2 and more languages need to be managed for your store at admin side. If you have partners or suppliers speak and write different lan.. This extension help you to make available for which currencies allowed to be shown on which specific langauge you want. Multi-languages supported Set up in store setting after installed. 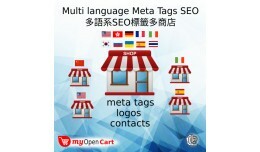 [Sample Site] https://demo.myopencart.hk/adm..
Currency Switch follow Languages (Multi-selectio..
Overviews: Do not expect any translator replce the human translation at this moment, but when you are working on thousands of products, you may export and import the products for translation (which drive a lot of stress to server) or copy and.. 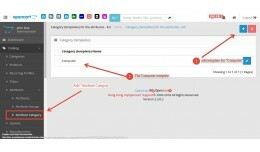 Attribute Category - Assign Attributes to products by Category This extension help you to assign attributes to products very fast after you create a category with related attributes. 1. First go to Attributes > Attribute Category - add the.. Bulk delete is fast and powerful, especially you selected what you want to delete. However, it is common to make mistake and delete something you regret. OOPS! 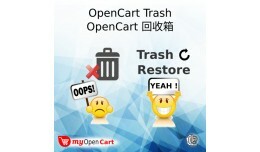 Don't worry, you can RESTORE it right now with this fabulous extension called Res..
Opencart Trash - Restore what you deleted from S..
Bilingual in English and Chinese (Hong Kong 香港) What it does? Since Hong Kong does not apply any postal code, but we have many zones which is easy for the postman or courier to delivery the parcel correctly if you indicate it precisely. ..
localisation Hong Kong Shipping Zones 香港�..
OC v3.0 supported ! Quick links icons make your work much easy and faster! Don't spend all your time trying to find the links in drop-down menus. Repeat everyday all the time with boring tasks. 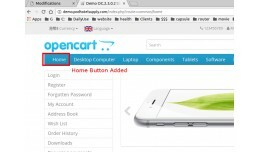 Demo Admin: https://v3.myopencart.hk/admi..
Slasoft Admin Quick Link -OC3: Add shortcuts on ..
Home button is essential when user to browse on the top menu, although the logo usually is set to return home page. (Multi-languages supported) This "Home" button added will not affect the other languages you have installed, and it will also ..
Free MOC Add HOME button in menu bar for default..
How it works? 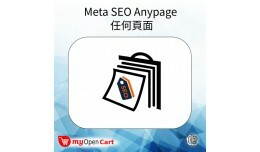 This special Meta SEO anypage can offer you any page with the route path Normally most SEO for Opencart is only work for PCIM, that are Product, Category, Information and Manufacturer(Brand) pages. This extension can help you t..
Store setting with Multi-languages support to improve the Search Search with other langauge you install. 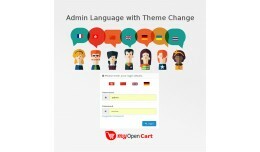 This is a MUST to have extension for any Opencart store with more than 1 language. 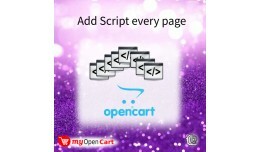 The formula to get better traffic and conversions using..
Slasoft Add script everypage with multi-langs st..
* New feature 1-click clear "Twig cache " is added for Opencart version 3. Enhanced with more features, and over 1000 very good for our developer This help you to remove all major caches in system, images cache and logs, so you don't need t..